Ohhhh- I think I would love Z. Try the museum of innocence ...much easier than Istanbul, although long...one if my all time favorites. I'll have to see if I can track down your recommendation - might be a good read for the winter. It doesn't appear to be available on Kindle though. Have you seen the documentary "They Call It Myanmar: Lifting the Curtain?" I just watched it and thought of you - a fascinating view of the country. I'll definitely look up your book recommendation though - I read Amy Tan's "The Joy Luck Club" in high school and I remember really liking it. 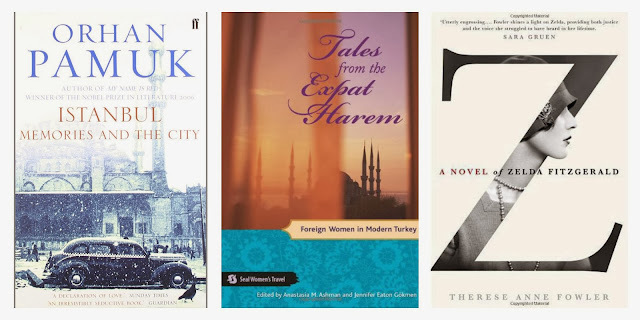 Jay, I felt the same way about Pamuk's Istanbul but will definitely put Tales from the Expat Harem on my list. I read The Paris Wife during a long, lazy vacation day and immediately wanted to go back to Paris :) I keep hearing awesome things about Z and am on the longest hold list for it at my library. I am so excited to read it! Oh I'm glad I'm not the only one who felt that way about 'Istanbul.' I felt so guilty not liking it! You'll have to let me know what you think of 'Z' when you finally get it - it ranked up there with The Paris Wife for me! I've read "Behind the Beautiful Forevers." It was a really great read. I've read a few books about India - "White Tiger" comes to mind but I know there are more. I'll add "Shantaram" to my wish list! i embarrassingly no longer read. i did so much as a kid and i think once i was voluntold to read books at school growing up, i grew disinterested. BUT i really want to get back into it! so thanks for sharing these! now that im in the US and doing a little (ok... A LOT) shopping, i can maybe pick a few up! hope all is well! :) and happy belated thanksgiving! Reading is practically like breathing to me. I couldn't even tell you a time where I didn't have a book on the go - maybe before I could read? The Kindle certainly helps when overseas but actually, getting books in Norway isn't so hard as we can order them from Amazon UK and they aren't taxed. The only downside is that Amazon has started charging shipping so it's better to order a few at a time. Enjoy the rest of your time in the US! I really liked The Lost Girls by Jennifer Bagget, Holly Corbett and Amanda Pressner. It enhanced my want to travel the world and I thought it was a nice light read to bring on a trip. I'll have to look into it Kayla! Thanks! I really enjoyed Pamuk's My Name Is Read, and Snow is great as well! I'm currently in the middle of The Kite Runner (after enjoying A Thousand Splendid Suns), but had no idea he had a new book out -- I'll add it to my list! It just came out in the last few months. I hope you're enjoying The Kite Runner - it was my first Husseini book and was quite memorable for me. i started the shining girls... and had to stop. so stressful and disturbing. I read the museum of innocence by pamuk recently and i kind of had the same vibe going...it was ok but i was ready for it to be done! that would pry give you more of an instanbul feel maybe though! I'm currently reading The Paris Wife, which has me in the mood to both rewatch Midnight in Paris and read more about some of these Jazz Age expats, like Zelda. I'm adding Z to my goodreads, it seems like something I would love. Hi! Stopping over from your comment on Betsy's blog about blogging success. (I really liked what you said, btw :) Anyway, I just wanted to say I love reading! I've seen Z on other lists, and I'm going to add it to mine. It sounds really good!